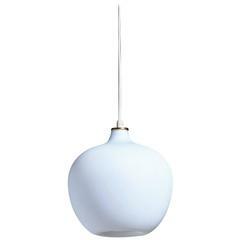 An adjustable Scandinavian modern pendel pendant light, Finland 1940s-1950s. 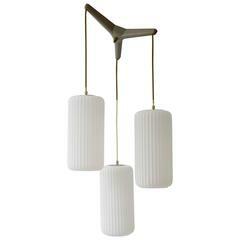 This well-kept metal pendant light features resemblances with some of Paavo Tynell's early designs, but is not documented and has no trademarks. It features a heavy quality metal shade with two perforated rims. The inside is lacquered bright yellow. Brass handle to adjust the drop of the light to your requirements. Original brass pendel and ceiling cap. The light is in excellent original vintage condition with age related patina on the brass parts of the light. Wiring checked by our in-house electrician and ready for immediate use. The total drop can be adjusted to your requirements from ca. 110 cm to 180 cm. Shade H 55 cm x Ø 18.5 cm The total length is ca. 180 cm. 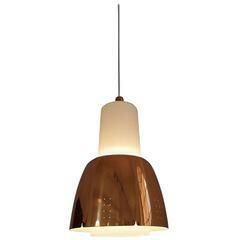 Italian 1950s pendant light in brass. Measures: Diameter 44 cm. Height 80 cm. Five E27 bulbs. Elegant 1950s ceiling light, Belgium. Measures: Diameter 45 cm. Height 100 cm. 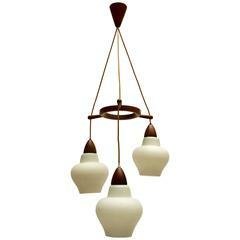 1950s Murano glass pendant light.